A 40-year-old man presented to our hospital with low-grade fever and acute pain in the neck, which had both begun a day before his visit and persisted through the night. He also reported difficulty opening his mouth and pain when bending his head back or swallowing. On examination, axillary temperature was 37.5ºC, but other vital signs were normal. The patient was alert and showed no meningeal signs. Leukocyte count was 9.0 (normal 4.0–8.7) ×109/L and C-reactive protein level was 100.95 (normal < 27.62) nmol/L. A nonsteroidal anti-inflammatory drug (NSAID) was started (loxoprofen 60 mg three times daily for five days). 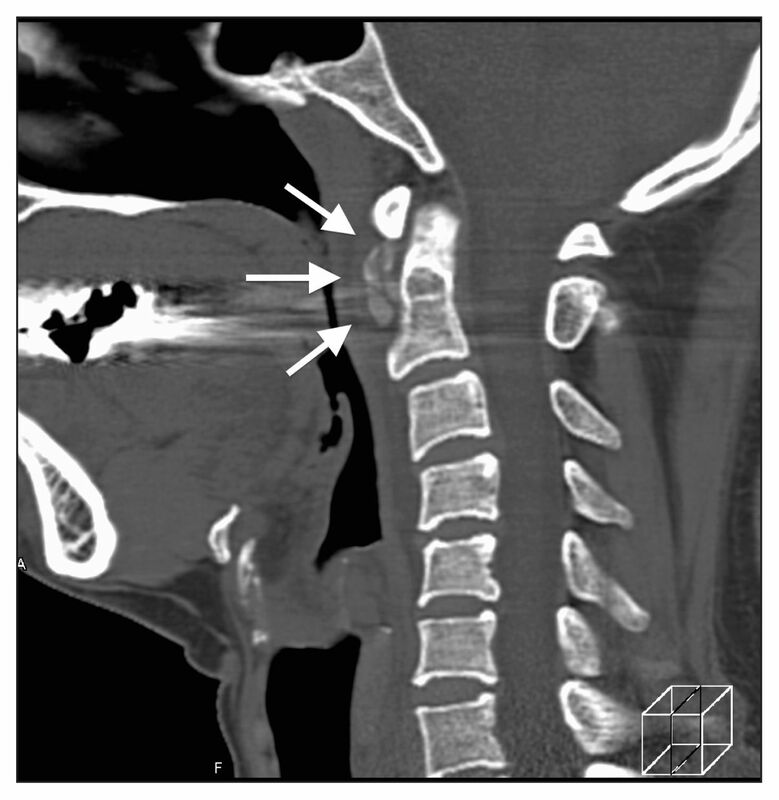 The next day, his symptoms persisted, and contrast-enhanced computed tomography (CT) of the neck showed retropharyngeal calcification in front of the C1–C2 vertebrae (Figure 1; Appendix 1, available at www.cmaj.ca/lookup/suppl/doi:10.1503/cmaj.140214/-/DC1). We diagnosed acute calcific retropharyngeal tendinitis. The patient’s symptoms improved gradually and resolved three days after the admission. Repeat CT three months later showed that the calcification had disappeared. Contrast-enhanced computed tomography scan (sagittal view) in a 40-year-old man with low-grade fever and acute neck pain showing prevertebral calcification (arrows). The diagnosis is made radiographically by prevertebral soft tissue swelling and calcification anterior to the C1–C2 vertebral bodies at the level of the dens, specifically the longus colli muscle.2 Computed tomography is preferred for differentiating this condition from retropharyngeal abscess, although case reports often include magnetic resonance imaging, which identifies prevertebral edema.1,2 Acute calcific retropharyngeal tendinitis is a self-limiting disease that spontaneously resolves after one to two weeks. Evidence from case reports suggests that a short course of NSAIDs and immobilization with a soft cervical collar can relieve symptoms.2 In cases of severe pain, additional medications, such as prednisolone or opioids, have been suggested.3 Clinicians may wish to keep this underdiagnosed benign condition in mind as part of the differential diagnosis of neck pain and odynophagia.
. Atraumatic neck pain and rigidity: a case of calcific retropharyngeal tendonitis. Am J Emerg Med 2012; 30:636.e1–2.
. Acute calcific tendinitis of the longus colli muscle: case report and review of the literature. Eur Spine J 2013;(22 Suppl 3):S434–8.
. Retropharyngeal calcific tendinitis: case report and review of literature. Emerg Radiol 2005;11: 375–80.